Franchise players vs Glue Guys, is the money always worth it? Part 1, like glue. In every good team, you got this low key player who gets steals, rebounds, hit his threes with great percentage, basically help his team win games without asking for the number one spot. On the other side, some so called franchise players get their amount of money and points but fail in being successful with their teams. Let’s start our matchup with the glue guys. Who thought he will be this good when he was drafted. Drafted on at the 25th spot in the 2014 draft, I didn’t think, despite having watched him several times in France, that he could be dominant at the center position. 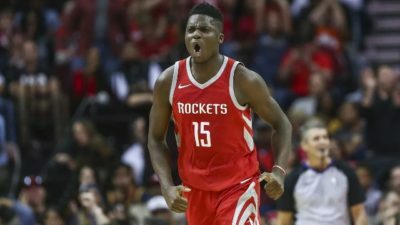 After two years behind the tutelage of Dwight Howard, Capela has entered the Rockets’ lineup and has been very complementary to Harden’s and now Paul’s scoring. Capela grabs rebounds, block shots and doesn’t need the ball much to score. He’s averaging 14pts 10.9rbds and 1.8blks, and is a pretender to Defensive player of the year title and the contract he deserves this summer. He looks like a gold miner back in the 19th century, but for sure he can play. The Australian forward is averaging 11.5pts 4.2rbds and 4.5as with 44% behind the 3pt line. He brings that stability and connection between the outside and inside players. One of the main reasons of Utah’s success despite Hayward departure. I know, he’s the best scorer of his team. Yet, how many teams would offer 8M dollars a year to someone averaging 23pts and 5as per game. Since Blake Griffin left, the Clippers have gone 13-9 in a very tough Western conference thanks to Sweet Lou. The Clips still dream about making the playoffs this year. At least, they will allow Williams to gain some stability in California. The star glue guy. A second rounder, the brashy Spartan fits perfectly alongside less talkative Curry, Thompson or Durant. 8rbds, 7as, 1.4 stls and 1.4blks per game, Green is one of the most complete PF in the League and the soul of the Warriors. We talk a lot about Simmons and Embiid but the Sixers are a team. Covington is the perfect fit alongside the two stars as he’s a very good shooter and defender. His 12.7pts 5.4rbds 1.9as 1.6stls and 0.8blk with 38% from 3 tells how much he brings to the table. In what is a pretty difficult year for the Spurs, Slow Mo has been his usual self. Almost 8pts, 6rbds, 3as, 1.5stls and a block per game, Anderson lacks the athleticism and shooting to become a star, but he’s the kind of player that you like to have in your team. Probably a long term asset for San Antonio. In 10 games with the Thunder, Corey Brewer has redefined himself with 10pts 3rbds, 2.2stls with 39% from 3. Behind Beal and Wall, Porter is the perfect 3 and D with 50% FG, more than 40% from 3 and the same defense he’s always been praised for. Last but not least, New Orleans can be thankful to duo of Emeka Okafor and Rajon Rondo. The former star center has been able to get back on the court after three years without play with 5pts, 5rbds and 1.3blk in 15min. Rondo, after unsuccessful years with Dallas, Sacramento and Chicago, may have found his new home as he gets playing time and averages 8pts 8as and 4rbds for playoff bound Pelicans. Next Next post: March Madness prospects recap : Who’s hot, who’s not?